I was never a makeup lover girl in my life. But I started using makeup 2 years back when I moved to California. As a beginner in makeup, I was skeptical in using darker shades so I always looked for girly shades, which are perfect for beginners. After a lot of research I finally found a product which has all shades from light to dark. You can wear the shades in day time or even in parties. This product was Urban Decay Naked 3 Palette. I loved the palette a-lot. But as you guys know that this year starting, I was doing a lot of travel & accidentally many of my eye shadows got broke. I was disheartened as those were very costly & I didn't want to spend that amount again. 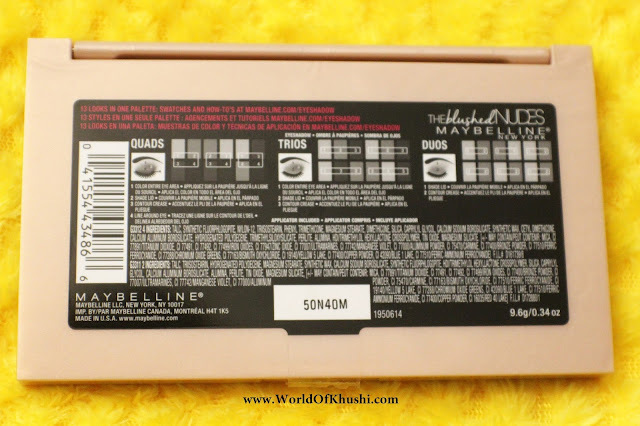 Last month I was looking through the Maybelline beauty section in the store & suddenly I saw MAYBELLINE : The Blushed Nudes Eyeshadow Palette. And it was literally Love at first sight. There were many reasons for that. First I love Rose Gold & this palette is completely in Rose Gold. Second all its eye shadows are very close to Urban Decay Eye Shadows; all girly & good range from light to dark. The best part of this palette is its price which is lesser than 1/4th of the Urban Decay. In general it is very-very affordable & you are getting 12 shades which is a great deal. I am using it from almost 1 month so I thought it is correct time to review the product. 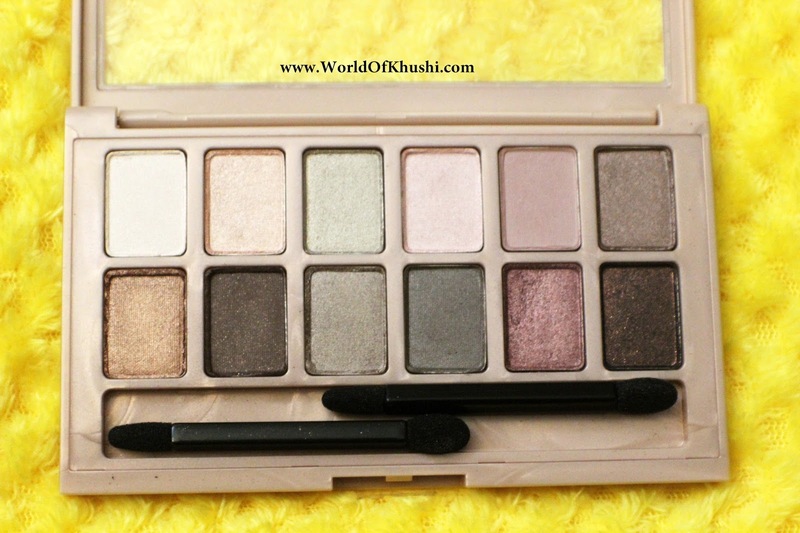 Below is my full review of MAYBELLINE : The Blushed Nudes Eyeshadow Palette. Frankly telling I am very much confused writing the review of this product. I love the packaging, I love the affordability, I love that there are 12 shades but I got little disappointment after applying it because it is not so pigmented. As for me Maybelline is a brand which gives good quality products in less price. But this eye shadow palette didn't meet my expectations. Initially I felt that it is Naked 3 dupe but it doesn't stand in competition of that. Good thing is, it is price-wise good although there are few shades in the palette which are quite similar. However you guys know me very well till now. If there is something which doesn't workout for me I will change it according to my requirement. 1. Always apply Eye Shadow Primer before applying this. 2. I apply Maybelline Color Tattoo as a base if I want to use the palette metallic shades. This gives a very good color. 3. To build up the consistency of the shades instead of using dry Makeup Brush I like to use wet Makeup Brush. These are my tips & tricks because my Eye Lids are dark as compared to my Face but you can try the product as other regular Eye Shadows. 1. I absolutely love the Rose Gold packaging. 2. Very girly shades. Best for Beginners. 3. All kinds of colors available, from light to dark. 4. Price wise very affordable. 6. If you apply primer it will last long. 7. Light weight! so pretty travel friendly! 8. Ideal for party wear as it have shimmer eye shadows. 9. Details are available in the back side of the palette so it will gives you idea how to use. 10. Contain some highlighters too. As the Eye-Shadows are not pigmented so my tip is to use with wet brush. This will help to build up the product & wear primer before so it will stay for long. 1. Light colors are not pigmented. 2. The Mirror is missing! 4. Primer is must for long wear. 5. Have only one mate shade. 6. Not a good competition of Urban Delay Naked 3. 7. Some shades are almost same. I am not very much impress! as for me Maybelline is one of my favorite brand & I have a very high expectations with this brand. But Ya!! According to price wise it's good product. I mean you will get 12 Eye Shadows which is good deal. And all the shades are very girly & contains all kinds of shades, from light to dark. No! Because I know that this Eye-Shadow Palette last me very long as I only apply makeup occasionally. And if I want to go with same shades instead of this I like to go with other palettes. I like to give it 3.4/5 . I like the Colors of this Palette & cute Rose Gold Packaging. Price wise also good one! But not happy with Pigmentation. 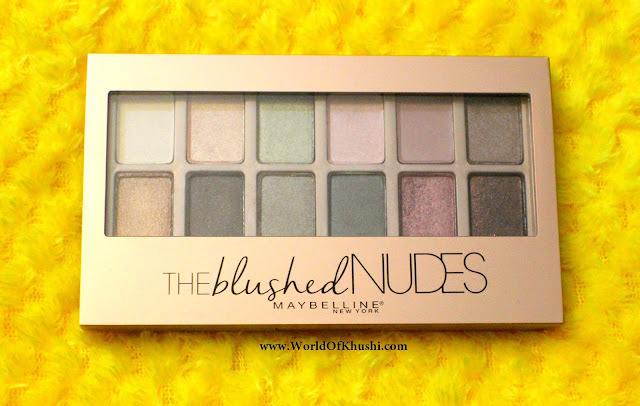 This is my full Review for MAYBELLINE : The Blushed Nudes Eye-Shadow Palette. I hope you girls get some idea about this product. This one is not the best one but according to the price it is pretty good product. You will get 12 Eyeshadows. Do try this product! Again I am telling you apply Eye Shadow Primer before Eye Shadows for good result. I wish you all the very best. Let me know your thoughts about this product. If you guys want me to do any Review of your choice then do let me know! !Guys do like the post & share it with everyone. Follow me on Khushi's World Facebook Page, Google+ , Instagram and Pinterest for more Posts.I will see you in next post till then take care.